The Horizon Convention Center is an innovative mix of historic beauty and modern design. Formerly Muncie, Indiana’s Federal Building, the Horizon Convention Center features a glass-enclosed pavillion, outdoor terrace and the classical splendor of the lobby’s original interior. A 1996 expansion increased the facility’s meeting space to 47,000 square feet. 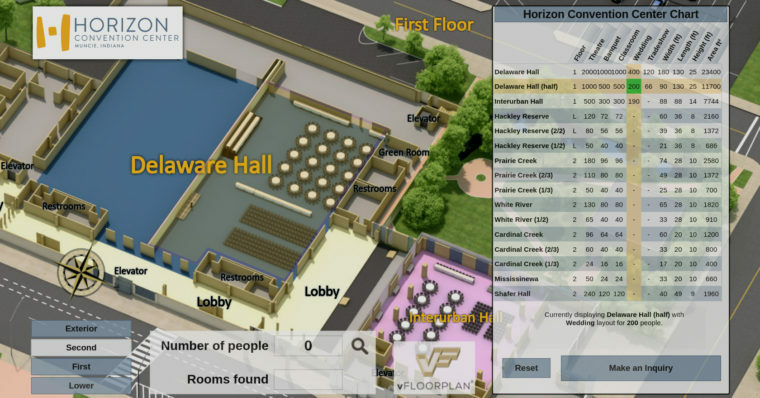 vFloorplan was delighted to work with Horizon and assist them by building 3D models and floorplans representing all their meeting and event spaces and buildings including a multi floor parking garage and surface parking with roads for their website, adding our instant x-ray search and interactive capacity chart and including linked highlights for their vFloorplan and chart numbers to deliver detailed enquiries directly to their sales team. 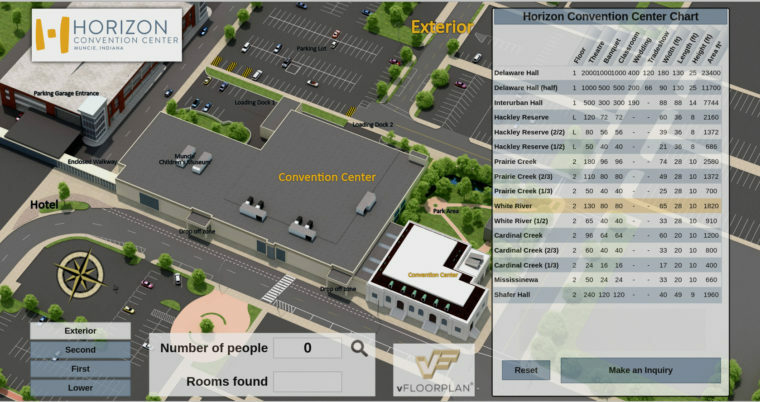 Horizon has a vFloorplan 3D version 4 on their website at HorizonConvention.com. Their President and CEO Joann H. McKinney had this to say “Having the vFloorplan on our website makes it so much easier for prospective clients to envision their event. Being able to clearly show them the location and capacity of each room jump-starts both the sales and the event-planning processes, often before the first email or phone call. vFloorplan shortens the time it takes to get to ‘yes'”.